It was suggested in July 2011 – The world of apps was an unknown entity to me at that stage but it seemed like the right thing to do if were to publish NEARLY THERE. So the search began and a few months later we found Firsty Group who developed the app with us. This decision meant a huge learning curve was to follow. We needed sound, we needed money, we needed a launch… to mention a few challenges we faced. Serendipity, proximity & timing presented us with the audio talent and the finance. Community spirit and PR talent supported and embraced the launch. I must also say that social networking sites such as FB & Twitter have given us an opportunity for a platform far beyond our local realms. It took 12 months ( idea to reality) to develop the app. Although the project of NEARLY THERE began way back in 2002. We ( Johanna, Gabrielle, Budley & Bishop) meet in 2001. I was home in West Cork recovering from a life threatening illness when we met. It was to be a pivotal point in all our lives. Everyday Budley and Bishop took us safely across the glorious West Cork countryside where friendships were forged and adventures had. Budley & Bishop showed an enchanted world brimming with sunsets & possibilities that took the two artists ( Gabby & I ) to our drawing boards where a frenzy of creativity began. We formed a creative partnership called CREATURES OF SERENDIPITY & found ourselves on the road to NEARLY THERE. The colouring feature in version 1 & the interactive audio nature of both the dialogue & narrative are what I must love about the functionality of the app. In version 2-The new feature button in colouring pages that allows the end user to send us the pictures they coloured – allowing us to interact with them. Also the fact that our readers can now join us on Facebook through the app. I love all the pages but 11 & 12 have to be my favourite images. I also love the naked chicken popping out of the bush on page 5 . All the pages have a special resonance for me as they are the memory of the journeys WE took through West Cork in 2001/2002. 7. What range would this app most suit? I find this such a hard question to answer. I believe it has something for all ages… 4 to 104. It’s an app to be shared and enjoyed by child, parent, grandparent, brother, sister, uncle, aunt… So why don’t you tell me? Yes. A few mini tweeks have been made to the audio. A button allowing the user to connect with us on Facebook has been added on the credits page and a special features button has been added to the colouring pages allowing the user to send us the images they’ve coloured allowing us to interact with them. 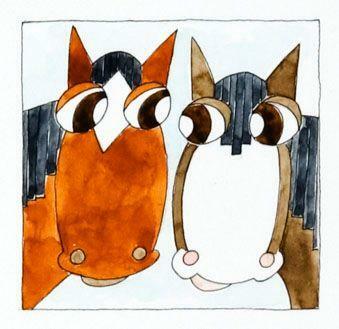 NEARLY THERE is a tale of two horses, Budley and Bishop, who go on an exciting journey; meeting mysterious strangers; overcoming obstacles and undergoing zany trials. Along the way, they encounter other animals all unhappy with their lot. Once freed from human captivity, these friends embark upon a quest for fulfillment; seemingly defenceless they thrive in the face of adversity. On their meanderings, music and song guides them towards their goal. On the roadside a naked chicken appears and says: Can you help me find my feathers? Bishop a thoroughbred bay mare asserted to her: Of course, come with us! And so the journey begins… on the road to NEARLY THERE! * Fully interactive storytelling including a map of Budley and Bishop’s journey. * Songs – original music played during the story to sing-a-long with. * Photographic media section where you can see the real life Budley and Bishop and other animals cared for by Johanna and Gabrielle.